Entrepreneur hopes gift will help start students on their own paths to success. Hugh L. Libby describes himself as a practical man. As the son of a welder and a hairdresser who grew up in the 1930s, he quickly learned the value of hard work. Now, he’s donated $2 million to Johnson County Community College toward the development of a new career and technical education center as part of the College’s largest campus transformation project in its history. His hope is to extend those values of diligence and pride in a job well done to the next generation of technicians and craftsmen. Libby's donation will be used to help fund the construction of a 69,000-square-foot facility on the west side of campus. The building will contain improved and expanded facilities for programs such as heating, ventilation and air conditioning (HVAC), electrical technology and automotive technology. Instead, as Libby explained, those students could have entered a career program and entered the workforce more quickly. “They come out of school and earn a good pay rate, then they go up the scale, then it’s possible for them to start their own business. It’s quite a lucrative future for many of them,” he said. Libby created his own profitable future in manufacturing. He owned the Libby Corporation, with two manufacturing facilities in Kansas City, Missouri. There, employees made military generators and starters for fighter jets, among other items. Despite living in Johnson County for decades, Libby didn’t know much about JCCC. That changed when a friend, Dr. Jerry Cook, began inviting him to campus. Cook, a trustee for the College, and Libby attended the grand opening of the Wylie Hospitality and Culinary Academy in 2013. “He was very impressed and began asking questions. He then wanted to tour more facilities, so we toured the BNSF facility, and looked at some of the programs offered there. Welding was very important to him and his business, so he was very interested in our career and technical programs,” Cook said. Libby’s gift is very reflective of his character, Cook said. He was intrigued by Libby’s hard work, intelligence and integrity when they first met in 1996. “His attitude, his politeness, his humility and his willingness to listen define his character of statesmanship,” Cook said. Libby’s “statesmanship” traces back to World War II. He joined the United States Navy at age 17. By age 19, he was commissioned as an officer with tours of duty in the Pacific Theater that include the Solomon Islands, the Philippines, Borneo and Okinawa. The Navy sent Libby to the U.S. Naval Reserve Midshipmen’s School at Columbia University in New York for officer training, and later to college. He initially studied physics but switched his major to economics. This was the era of the A-bomb, where the field of physics went through its own explosion of change. Libby didn’t want to be a part of that. Instead, he started his own business. His career expanded into boardrooms; he has been a 12-year board member of Cleveland-based Lincoln Electric, a worldwide designer and manufacturer of welding products and systems, and held seats on the boards of four different banks. Libby also is a major benefactor to Mayo Clinic in Rochester, Minn., the University of Kansas Hospital’s Alzheimer’s unit and Boys Scouts of America’s Heart of America Council. He is a member of the Boy Scouts’ Founders Circle. Libby learned to fly so he could pilot himself from meeting to meeting. 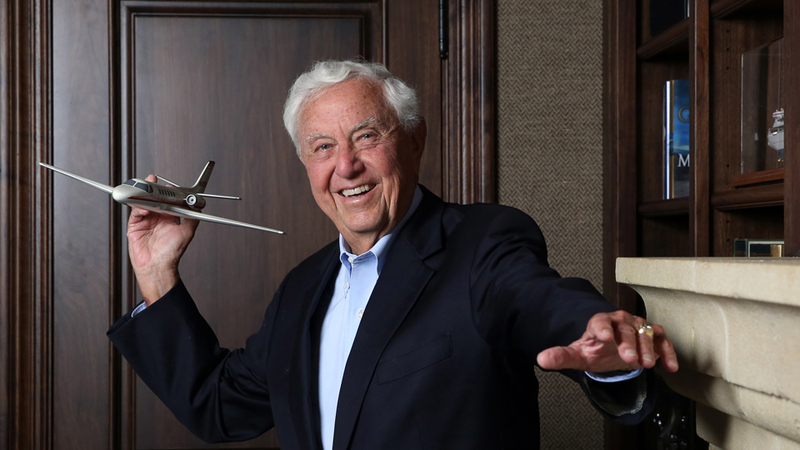 He met automotive entrepreneur Roger Penske at an airstrip in Detroit before their business meeting. “Roger said to me, ‘Would you like to go into the city to get lunch for you and your pilot?’ I said, ‘I am the pilot.’” Penske, who owned an Indy racing team and raced cars himself, was impressed. Libby later landed a major business deal with the auto mogul. “Mostly, flying just gave me the flexibility to go where I needed to go,” he said. His log book, in the top drawer of a cabinet in his home office, shows his recorded flight hours: 7,537. That’s equal to 3 1/2+ years as a professional pilot working 40 hours a week. In that same office, models of the planes he’s owned over the years decorate the bookshelves. “You buy the model, they give you the plane for free,” he joked. Learn more details about JCCC’s Facilities Master Plan online. Want to donate to the transformational facilities project? Email the JCCC Foundation or call 913-469-3835.